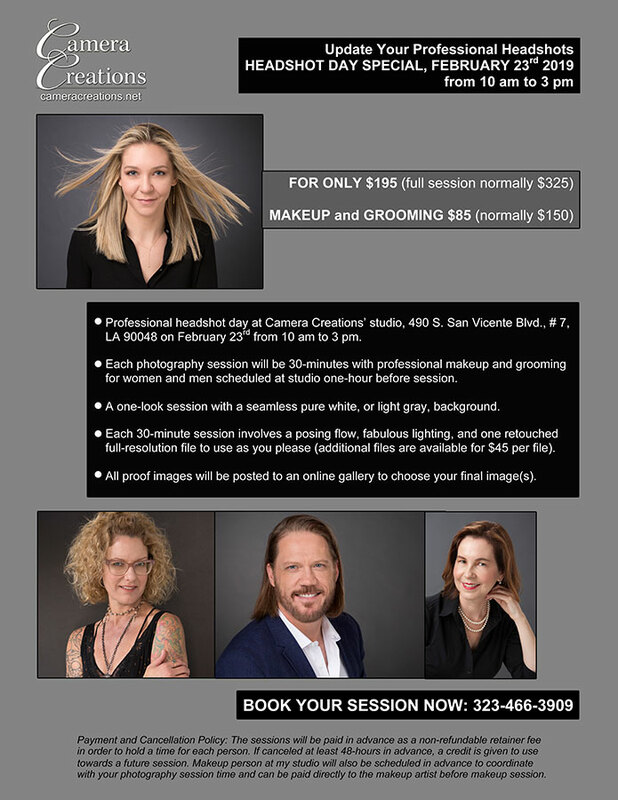 Professional headshot day at Camera Creations’ studio, 490 S. San Vicente Blvd., # 7, LA 90048 on February 23rd from 10 am to 3 pm. Each photography session will be 30-minutes with professional makeup and grooming for women and men scheduled at studio one-hour before session. A one-look session with a seamless pure white, or light gray, background. Each 30-minute session involves a posing flow, fabulous lighting, and one retouched full-resolution file to use as you please (additional files are available for $45 per file). All proof images will be posted to an online gallery to choose your final image(s). Payment and Cancellation Policy: The sessions will be paid in advance as a non-refundable retainer fee in order to hold a time for each person. If canceled at least 48-hours in advance, a credit is given to use towards a future session. Makeup person at my studio will also be scheduled in advance to coordinate with your photography session time and can be paid directly to the makeup artist before makeup session.